Do you know about the traditional clothes of Japan? The kimono is one of the most famous ones. There are many other types of traditional Japanese clothes. 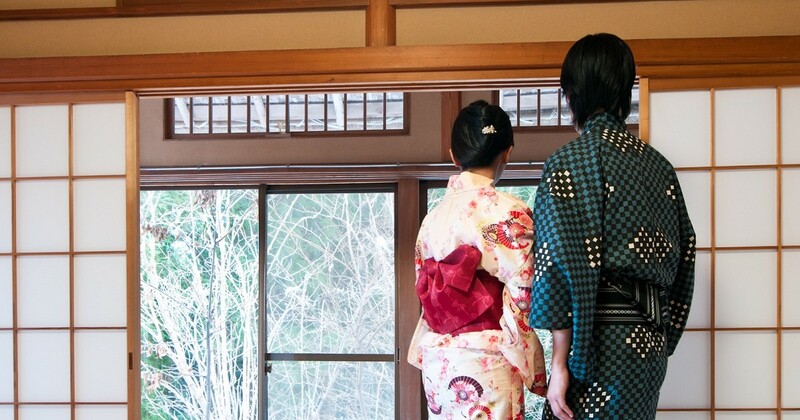 Actually, you’ll be able to try on the various traditional clothes at a Hakone Ryokan. While it’s easy to put on, we should learn about some of the basic manners first. In this article, we’ll be introducing to you the different kinds of traditional outfits available at Hakone Ryokan! 1. What is the “Yukata”? Yukata is a type of kimono. It is mainly made of hemp and cotton, and is perfect for wear after a bath as it will help you absorb the excess moisture on your damp skin. Recently, the yukata has become popular at summer events like fireworks festivals and bon-odori festivals, and is seen to be rather fashionable. The yukata is the simplest type of kimono. The yukatas found in ryokans are even simpler than standard ones. All you have to put on is the obi and the yukata itself, beside your underclothes. So how do we go about wearing it? 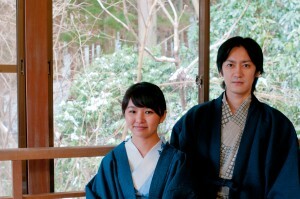 Many Hakone Ryokans have Yukatas prepared for you. We recommend wearing it after you visit the hot springs. You can try wearing it in your room first if you’re worried about getting it right the first time. The Ryokan Yukatas go by S (Small), M (Medium) and L (Large). It is about right if the hem reaches your ankles when you put it on. If it is too long, the hem will be dragged along the floor, dirtying it. Do ask for a change if the size isn’t suitable. The yukata is meant to be worn over your bare skin, but it is alright to wear a camisole or a shirt inside as well. Feel feee to wear shorts or leggings below. When the Japanese wear the yukata to be stylish, they usually put it on with their normal clothes underneath. There are various ways to tie your obi. 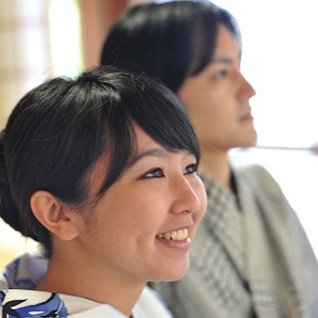 Let us introduce a simple way that people putting on the yukata for the first time can follow easily. 1. First, position the obi at the front and middle of your body. 2.Bring the obi around your body and pull the two ends to the back. 3.Cross the two ends at the back and give them a tight pull. 4.Bring the two ends around your body and bring them to the front. 5.Tie it once by the side of your body and tie a bowknot after that. ⑦ And you’re done! Put it on after a bath and transform into a Japanese traditional-looking hot spring customer! Since its a rare experience at a Hakone Ryokans, the males should try the yukata on as well. Guys who put the yukata on the right way look cool! It is easy to wear it well as long as you follow these few points. The way to put it on is almost the same as with the ladies, so do refer to that as well. Yukatas for males come in M (Medium), L (Large) and X L (Extra Large). Put your arms through and try it on to get a gauge of the size. If the hem reaches your feet, it’s about the right size. 1.Fold the first 30cm of one side of the obi into half. 2.Face the open end upwards, and position the rest of the obi slightly below your belly button. 3.Bring the obi around your waist in an anticlockwise direction. Pull it tight after 2-3 rounds. 4.Take the thicker end of the obi and measure an arm’s length of it. Fold that length of cloth inwards. 5.Tie the thinner end and the thicker end together. The thinner end should be at the bottom, the thicker on top. 6.Pull them tight and into a vertical arrangement. 7.Fold the thinner end up and the thicker end down. Pull the thinner end through downwards so that it overlaps with the thicker part, and pull both ends tight. 8.Pull the knot to the back in a clockwise direction. 9.Adjust the shape and you’re done! Some of Hakone Ryokans lend out the “Haori” and “Hanten” along with Yukatas. The haori is a kimono outerwear that reaches till your waist. The haori originated in the 15~16th century, when a Sengoku warlord wore it above his armour. That is called the jin-baori. They usually have bright colours and flashy designs, and are often featured in animes and games. You can put the haori on when walking around the Hakone Ryokan or at public places, and it also serves to keep you warm. The hanten has several variations to it, but the ones provided at the ryokan are meant for protection against the cold. It looks similar to the haori, and has cotton stuffed in its middle, making it warm to wear over your kimono in winter. There is also something called the tenzen. Like the haori, you can also wear it out to public places. It’s cool to put on wooden shoes called the “Geta” to go out in when wearing a yukata. There are places that have it available for borrowing. They make a “click-clack” sound when walking, giving it a very “Japanese” feel. Please do refrain from spoiling the geta by hitting it against the ground too hard though. There are also Hakone Ryokans that lend out “Samues” and “Jinbeis”. What exactly are they and how are they different from Yukatas? Both the samue and jinbei are similar to Western clothes, and are easier to wear as compared to the yukata. The samue was originally what Buddhist priests wore to work. Like the yuata, the top is worn by layering one side over the other, and with slightly wide sleeves. We wear long pants below. The jinbei is casual traditional wear that gained popularity amongst the common folks in recent ages. Its shape resembles the samue but is generally worn with knee-length shorts. Also, there are slits in the sleeves to make it more cooling. While the samue can be worn all-year round, the jinbei is only for the summer. It looks very bad when you move around clumsily in a yukata. Do close your legs when walking in one, and not spray your legs apart. Be sure to fold the hem of your yukata when sitting and not expose the front. When picking things up, fold the sleeve up with your other hand so as to prevent it from touching other things below. It may sound very troublesome, but do try to put up with it to look good. Well then, let’s try going for a stroll or some shopping around the Ryokan in your yukata, samue, haori or haten, along with your geta. Hakone has a lot of hot springs around, all with their own specialities, and it will be fun to take long walks around the area or go for hot springs. However, these outfits are casual wear, and there are some places you shouldn’t go to in them. Usually, you should only wear your yukatas out to places that are a walkable distance from your Ryokan. Let’s not board public transport like trains or buses in them. It is a little embarrassing. However, you’ll often catch people in them on public transport during summer festivals or fireworks festivals. There are many ryokans where you are allowed to wear your yukata into the ryokan restaurant. However, please do not wear it out to restaurants outside. Let’s go dressed appropriately. Other hotels or ryokans are akin to someone else’s house. It would be better to wear your own clothes when visiting. You can have a genuine hot spring experience as long as you know the basic ways of putting the traditional clothes on, as well as the appropriate manners! Let’s master the way of dressing traditionally, and have a chic Hakone trip!